Home > News > News > Solar Prethermography, a new Enerconcept benefit! Once again, Enerconcept innovates with its brand new Solar PrethermographyTM tool allowing you to simulate the performance of each m2 of wall-mounted solar air heater even before they are installed. We are often asked to create wall-mounted solar air heater with all kinds of geometries, shapes and colors sometimes with obstacles such as windows, doors or openings. One might be tempted to think that with so many criterias, the installation of a wall-mounted solar air heater would not be possible. With Enerconcept, anything is possible. 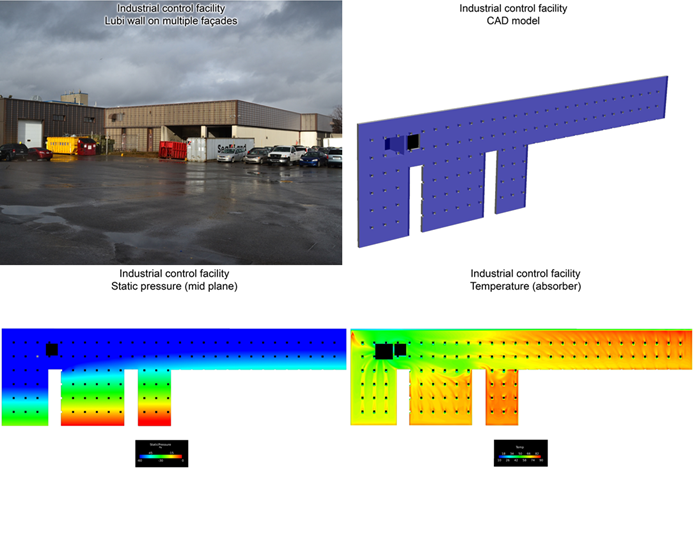 After two years of research in collaboration with Canada’s National Research Center (NRC), The Solar PrethermographyTM tool can now illustrate the performance of a wall-mounted solar air heater before it is installed. This gives us an optimization during the specification phase and an increased warranty of the wall’s thermal performance. Enerconcept’s Solar PrethermographyTM tool is available for any architect, engineer, designer or manager who wants to ensure the optimal performance of his investment or for his client. Enerconcept not only offers the world’s best solar hot air collectors but demonstrates, once again, its undisputed position as a world leader in solar air heating.